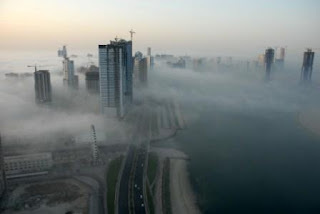 Many parts of Dubai and Sharjah were enveloped in a thick blanket of fog that spread across various other parts of UAE especially in the northern emirates. The dense morning fog resulted in low visibility on roads. Forecasters warned drivers to be careful on main highways across the country which were clogged with fog. Though later in the afternoon clear skies and sunny weather is expected across the emirates. Despite many warnings and tips from police officials, accidents take place in such weather conditions and reported earlier this year (October 18th) was a 32 car pile-up on the Dubai Bypass road just before the Al-Ain highway interchange. Manipal University students share their experiences and pieces of advice while driving on foggy roads as they make their way to Academic City. Anchal Arya specializing in Visual Communication said, “I would like to tell all the young drivers to drive slow as they are not only risking their life but also others”. Ahmed Abdullah, who recently obtained his driving license said, “This was my first time driving in foggy conditions and I was excited about it. Though the visibility was very low on the Dubai bypass road but the cars were maintaining a safe distance. And one tip, please use low beam headlights/fog lights during such weather conditions”. Have an experience you would like to share? Do comment below.